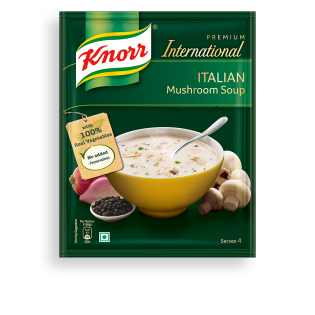 Knorr has hand-picked the best quality mushrooms and mixed it with spices to make this delicious Knorr Italian Mushroom Soup. A perfect blend of international flavors gives it its tantalizing aroma, mouth-watering taste and perfect consistency. What's in our Italian Mushroom Soup? 1) Made with 100% real vegetables 2) Contains no added preservatives 3) Ready to eat in 3 simple steps 4) Serves 4 5) Goes well with: White Sauce Pasta or Red Sauce Pasta 6) Chef's Tip: Garnish with Croutons for extra crunchiness 7) Knorr Italian Mushroom soup can be used to make a variety of dishes like Baked Cannelloni, Vegetable Au Gratin and White Pasta. 1. Empty entire contents of pack in 4 cups normal water (600ml) 2. Place on stove and bring to a boil while stirring continuously to avoid lumps. 3. Simmer for 3 minutes and serve hot!